Now that we've cried ALL the tears about the beautiful wedding of Prince Harry and Meghan Markle, it's time to eat. 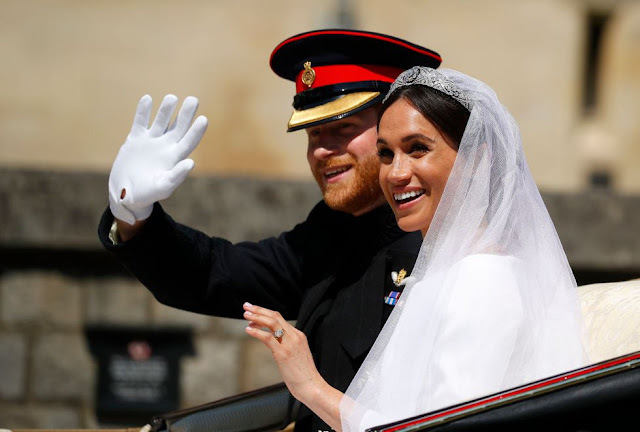 The Duke and Duchess of Sussex are headed to lunch with 600 guests, including familiar faces like Oprah Winfrey, George and Amal Clooney, and James Cordon. The Lunchtime Reception, officially hosted by Her Majesty The Queen, is taking place at St. George's Hall in Windsor Castle, and Kensington Palace just shared the full menu. Along with the royal couple's massive elderflower cake, there are three sweets on the menu this afternoon – Champagne and Pistachio Macaroons, Orange Crème Brûlée Tartlets, and Miniature Rhubarb Crumble Tartlets. Pol Roger Brut Réserve Champagne, a selection of wines, and an apple elderflower mocktail — made with the same elderflower syrup as used in the wedding cake! — will be served. Cheers to the newlyweds!